After the release of the preseason AP Top 25 Poll last week, we took a look at how the preseason poll has compared to the final AP poll over the last 10 seasons. We found that the preseason No. 2 team has averaged one more win per season than the preseason No. 1 team, that the eventual national champion usually begins the season ranked inside the top five, and that for whatever reason, the preseason No. 13 team has fared worse – on average – than almost every other team that's ranked in the preseason. Now we're looking at individual schools and how their final rankings in the AP poll have stacked up against their positions in the preseason poll since the start of the BCS era (1998). Which programs have most outperformed their preseason rankings? And which schools have most underperformed in the last 19 years, given their preseason rankings? For every school that appeared in the preseason or final AP Top 25 Poll from 1998-2016, we tracked the annual difference between each school's preseason and final ranking. A school was awarded one point for each spot it improved in the AP poll for a given year, or it lost one point for each spot it dropped in the rankings. For example, Oklahoma State began last season ranked No. 21 and the Cowboys finished the season ranked No. 11, so they received 10 points for the season. On the other hand, Ole Miss was ranked No. 11 in the preseason but the Rebels weren't ranked in the final poll, so they received -15 points for the year. Teams gained a point for making the jump from being not ranked to being ranked No. 25, and lost a point for falling out of the poll. We'll start with the schools that have "underperformed" the most, because many of the names may be surprising. The 10 biggest underperformers, when comparing the preseason AP Poll to the final poll since the start of the BCS era, include four schools from the SEC, two from the Big 12, two from the Big Ten, one from the ACC and one from the Pac-12. This group has combined to win nine of the last 19 national championships, showing that the word "underperform" is relative to movement in the polls that is often created by high annual preseason expectations over a nearly two-decade span. As weird as it sounds, the school that has dropped the most from its preseason AP ranking to its final spot in the yearly poll won two national titles during the years evaluated. Florida State was crowned the national champion in 1999 and 2013, but the Seminoles have dropped an average of 4.8 spots annually in the AP Poll – from preseason to postseason – in the last 19 seasons. Of course, schools that are consistently ranked towards the top of the poll have more room to fall than improve, but the Seminoles' preseason ranking has worsened in 14 of the last 19 years. 2002 (No. 3 to No. 21), 2011 (No. 6 to No. 23), and 2006 (No. 11 to unranked) were especially painful seasons to Florida State's point total. The Cornhuskers haven't been ranked in the last four final AP Top 25 Polls. In the three seasons — 2010-2012 — before that, they finished No. 25, No. 24, and No. 20, respectively, which shows the decline of Nebraska football from its peak in the 1980s and '90s. Tom Osborne, the former Nebraska coach who won two consensus national championships and split a third title with Michigan during his tenure from 1973-1997, coached his final season the year before the BCS era began. The Volunteers have finished the last two seasons ranked No. 22 in the AP Poll. They weren't ranked in the previous seven final polls. Tennessee went 13-0 and won the national championship in 1998, the first season of the study, but the Vols' biggest moves in the poll since then have been in the wrong direction. Once-promising seasons that began with Tennessee ranked in the top 25, including a pair of top-five starts, ended with the Vols on the outside of the top 25: 2005 (No. 3 to unranked), 2002 (No. 5 to unranked), 2000 (No. 12 to unranked), and 2008 (No. 18 to unranked). Here are the schools that have most outperformed their preseason rankings since the start of the BCS era. Interestingly, the top three schools were members of the Mountain West during a portion of the years studied. Beginning in 2001, the Broncos had a knack for climbing into the top 15, often after beginning the season unranked. Voters were slow to react to what former Boise State head coach Dan Hawkins built, then Chris Petersen continued, in Boise, Idaho. In 2001, 2002, 2003, 2004, 2006, 2008, and 2014, Boise State was unranked in the preseason but finished with an average ranking of 13.7, including a No. 5 final ranking in '06. The Utes haven't been an annual staple in the preseason AP poll, starting the year in the top 25 in just two of the last 19 seasons, but they've finished seven of those seasons ranked. Utah was No. 2 in the final AP Top 25 Poll in 2008 and No. 4 in 2004, two major reasons why Utah is second on the list. TCU had an annual net point total that was zero, or negative, in nine of the years examined. 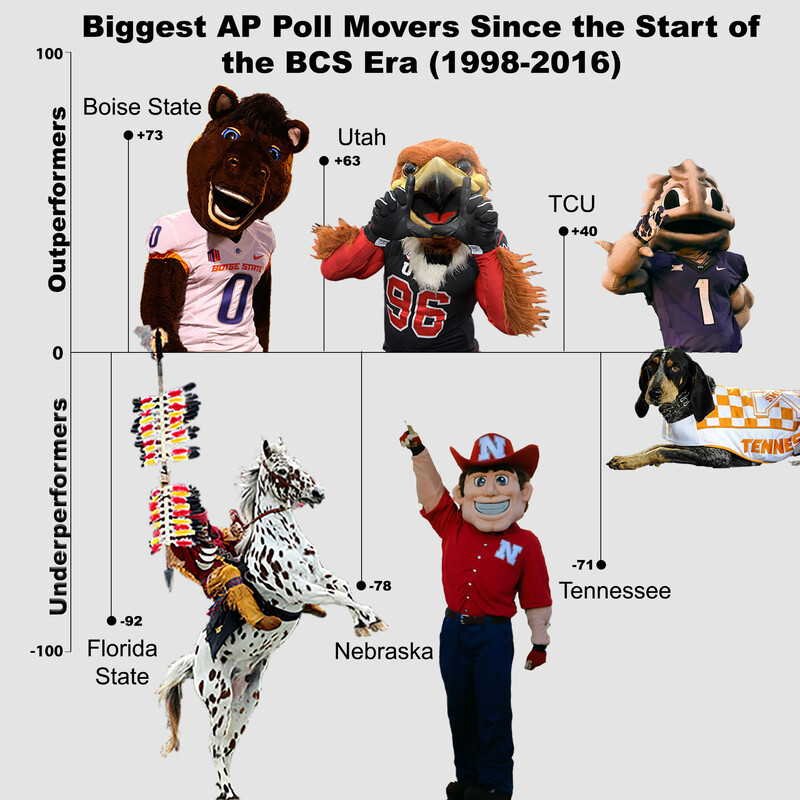 However, the Horned Frogs' climbs in the poll in 2005, 2008, 2009, and 2014 elevated them to the status as the third-biggest poll outperformer since '98. TCU started and/or finished the season ranked in the 20s a few times in the early 2000s but 2005 was the program's break-through season with an 11-1 record and a win in the Houston Bowl. The Horned Frogs went from unranked in the preseason to No. 11 in the final poll. Led by quarterback Andy Dalton, they finished inside the top 10 in back-to-back seasons in 2008 and 2009, before they reached No. 3 in the final poll in 2014 in their third season in the Big 12.